A Complete Guide To Biking With Dogs. How To Cycle Safely With A Dog, And The Best Dog Bike Trailers. We’ll look at options with biking with dogs running next to you, and ways for your dog to travel too. Riding a bike with your dog is a fun way to exercise, allowing you to spend quality time together in the fresh air. Your dog can accompany you either by running alongside you, or transported in a trailer or sidecar attached to the bike. If you have a puppy, he can also join you on a bike ride in a dog bike basket, seat or carrier. But before you cycle off into the sunset with your beloved pooch, you need to consider certain issues regarding your dog’s health and safety. In this article, we guide you on how to prepare your dog for a bike ride, the equipment you will need and precautions you should take to ensure a smooth and pleasant journey for you and your dog! Labradors are high energy dogs, so having your pet run alongside you on your bike is an ideal way to contain some of his exuberance and keep him fit. However, for some dogs this is not always possible for various reasons. 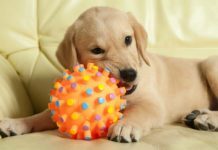 Puppies and young dogs should not carry out such strenuous exercise until they are at least 18 months old as it can harm their musculoskeletal development. 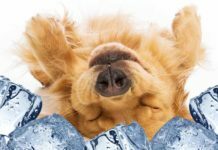 With senior dogs, they may find it difficult to run and possibly suffer from arthritis or other joint problem. 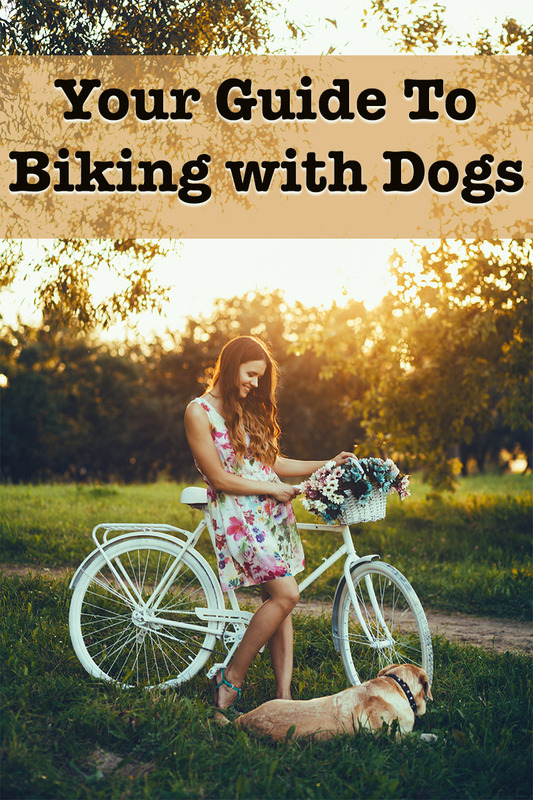 Let’s look at some of the various options for transporting your dog by bike, so he doesn’t have to stay behind and miss out on all the fun! A dog bike trailer attaches to the back of a bicycle and is towed along by the rider. A trailer or wagon for dogs should be big enough for your pet to sit, stand, lie down and turn around in comfortably. When looking for a large dog bike trailer, go for a design that has a broad wheelbase and a low center of gravity. A trailer with a removable floor makes it easier to clean, and one with large wheels gives your dog a smoother ride. A bicycle pet trailer should have a protective cover for different kinds of weather, with an opening big enough for your Labrador to get in and out of easily. Always opt for a dog bike trailer with the best safety features that meet certain standards, e.g., the American Society for Testing and Materials. These features should include a safety harness to keep your dog inside, a safety strap for the hitch should the trailer become detached and an automatic braking system. The bicycle pet trailer should also ideally have high visibility material and reflectors. Not all the options out there will tick every box, but here are some strong contenders you to choose from. The PetEgo Comfort Wagon is a lovely choice. Lightweight with an aluminum frame, it is relatively easy to tow. It also has suspension for a smooth ride along with a full zip up cover. 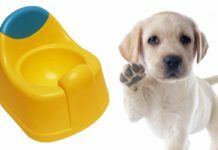 Big enough to fit even an adult Labrador, this is a great choice for owners of bigger dog breeds. Another great choice is the Doggyhut Large Dog Bike Trailer. This bicycle pet trailer is sturdy, with a powder coated steel frame and non slip floorboards. It folds flat for easy storage when not in use, and can fit even the largest Lab. 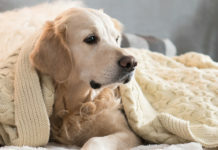 Although you might want to pop a blanket on the floor to keep them more comfortable . Check out this great wagon for dogs on Amazon here. A large dog bike trailer is ideal when biking with dogs, but what about puppies? If you want to take your Labrador puppy for a bike ride, then using a dog bike basket is one such option. To prevent your small puppy from trying to jump out, look for a basket that has a leash or harness attachment or a mesh top with a zip. A dog bike basket fits either to the front of the bicycle on the handlebars or behind the seat on a back rack. The advantage of having the basket at the front means you can keep an eye on your puppy, but the disadvantage is that it can make steering harder. However with a little practice this doesn’t seem to cause a problem for most people. Dog bike baskets can be either wicker or fabric with some including storage space for toys, treats, water bottle, and leash. The Snoozer Bicycle Pet Basket is a very popular option for biking with dogs of small breeds or puppies. It is designed with your dog’s comfort and safety in mind, with securing clip and plenty of padding. Another fun option is the Solvit Tagalong Puppy Bike Basket. This traditional styled basket is actually made of a durable, weather resistant synthetic rattan. It also comes with a faux sheepskin comfy liner, which importantly is also removable and washable. Using a dog carrier for bike rides is useful not only for transporting your small pup when cycling, but for use as a portable carrier as well. The carrier can be carried on your shoulder or used in a car, keeping your puppy safe. The Solvit Tagalong dog carrier for bike riders has an adjustable safety leash which keeps your pup in place when you are riding. This is a front fitting dog bike basket. A bicycle sidecar for dogs connects to an adult-size bike at the side, so you are in direct contact with your dog. As your dog can see you, it gives him greater security and confidence when going on a ride as opposed to a dog bike trailer. A sidecar is often fitted with three leash rings to leash your dog in different positions. Accidents can and do happen when riding a bike. Most bike riders wear protective gear when cycling, and you should do the same for your dog. Before biking with dogs, you should consider buying safety bike accessories for dogs to keep him protected during a ride. When using a trailer or basket, introduce your dog to it slowly by using positive reinforcements before attaching it securely to your bike. Go for short, slow rides over smooth surfaces at first so he can get used to it. During a bike trip, always stop and let your dog out so he can stretch his legs and have some water. Never leave your puppy in a basket or other carrier when you park your bike as it could easily fall over and injure your pet. Some dogs don’t like being restricted and may not take to being transported by bike. It all depends on the individual dog. Now let’s look at riding a bike with your dog running alongside you. Riding a bike with your dog running next to you is a great way for you both to exercise. 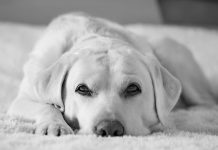 However, it is essential that your Labrador has a health check with a veterinarian first to ensure he can cope with such strenuous exercise. If your dog is overweight, then biking with dogs would be too much for him at this stage. Help him lose weight with regular walks and a proper diet. Before you go biking with your dog, make sure he is obedient, responding to your commands and can heel. Riding a bike with a dog that is undisciplined can be extremely dangerous and could cause a serious accident. Often you will see owners cycling with the leash in their hand and the dog running alongside them. This practice is very unsafe as the leash could become caught in the wheels of the bike, or the dog could pull the bike over risking a serious accident. Before you start, you will need to buy the correct gear and bike accessories for dogs to stay safe during a cycle ride. A non-tangling leash is essential. 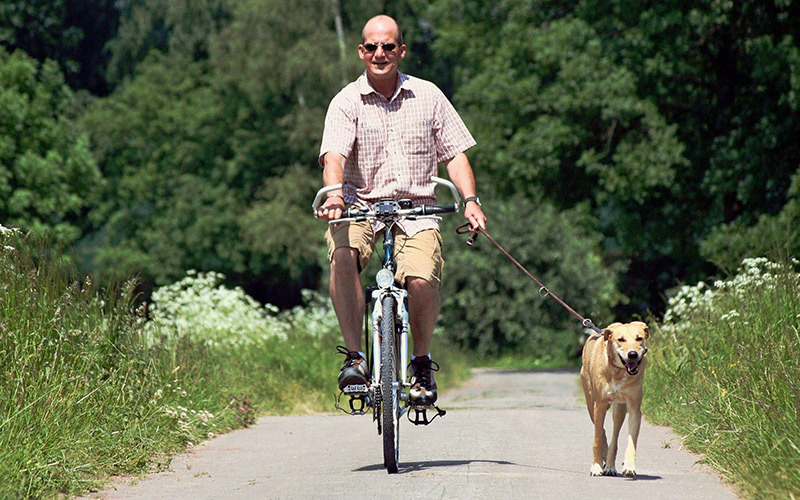 The Petego Cycleash Universal Dog Bike Leash is a very popular option. When biking with dogs the leash should be attached to a no-pull harness on your dog rather than a collar. 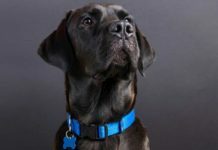 When looking for a bike attachment for dogs, there a variety of designs available on the market such as a dog bike leash. 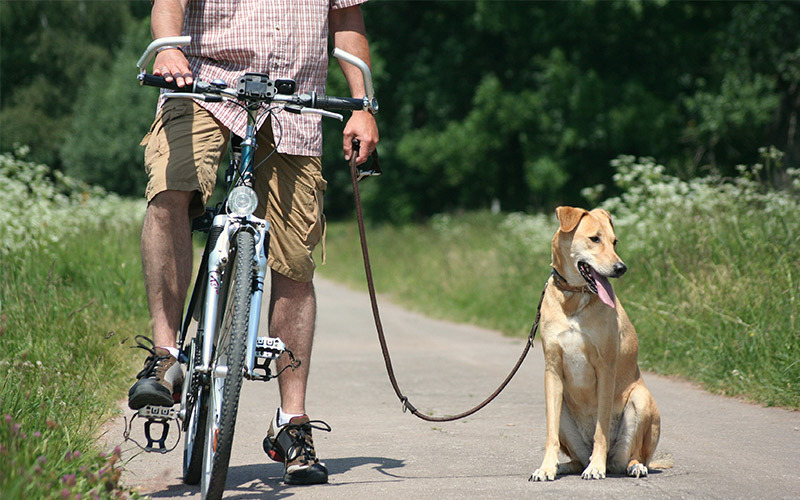 A dog bike leash must not be too long or too short and usually connects to either the frame of the bike or the seat post with a cord attaching to the dog’s harness. It is possible to attach more than one dog bike leash if you wish to go cycling with two dogs. However, for better control, a bike tow leash is considered the safest and best option for riding with your dog. This one is a very popular and well-reviewed option. The rigid dog leash attaches to the rear wheel of the bike, giving you greater stability, and is designed to allow the dog to stay next to you in clear view. A bike tow leash keeps your dog in heel position and has a mechanism that communicates with your dog for changes of direction. When buying any bike attachment for dogs, always read the instructions carefully, so you install it correctly to ensure your Labrador’s safety. As well as a suitable leash and harness, you will need to consider other essential bike accessories for dogs. Your Labrador should wear a reflective vest or lights so he can be seen easily. To protect your pet’s feet from sharp objects and hot concrete, you should provide him with dog booties. 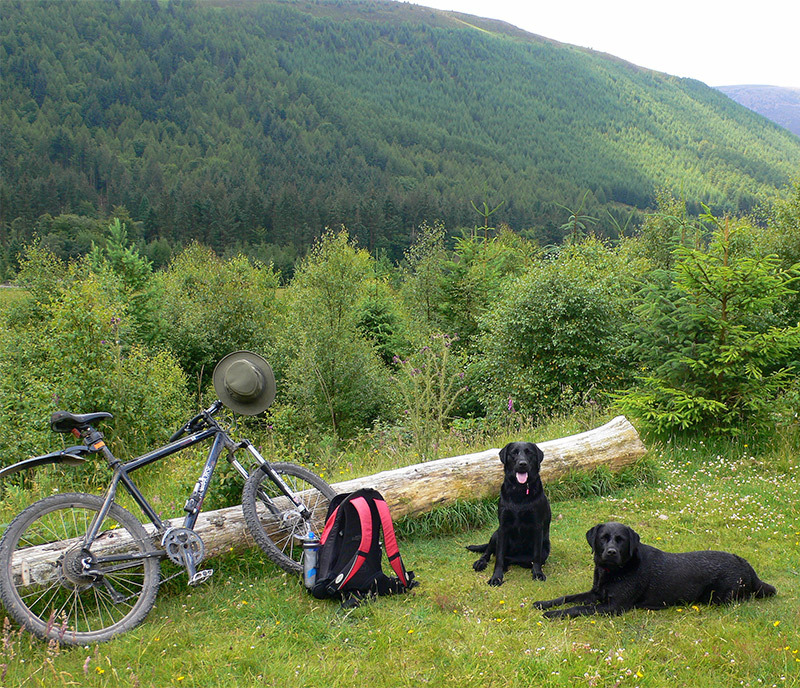 Once your Labrador has seen your bike, walk with him on one side, holding the leash, and you on the other. When your dog is comfortable doing this, attach him to the bike leash and stay in the walk. You can start practicing the commands you will need to say during a ride for slowing down, turning and stopping. Continue by mounting the bike and going for a short leisurely ride. You should do this for a couple of weeks, building up gradually to trotting speed. Try to use smooth, soft roads and avoid riding in heavy traffic. When biking with your dog, observe him regularly to see if he is getting tired or panting heavily. Take regular breaks so he can rest and have a drink and a treat. Always detach your dog from the bike when you are not riding. Towing a dog bike trailer when biking with dogs is a good idea in case he becomes tired, particularly on longer journeys. That way, he can relax and enjoy the rest of the ride in comfort. It’s Time To Go Biking With Dogs! Providing you prepare your dog correctly and have the necessary gear and equipment, you should be able to safely enjoy biking with your dog whichever way you choose to do it. Be aware though, that it is not for all dogs. If your pet doesn’t appear to enjoy it, then don’t force him. After all, his happiness is most important. However, many dogs love the chance to go for a bike ride with their owners and make excellent exercise partners! Do you go cycling with your dog? Does he run alongside you or transported? Share your stories about biking with dogs. Previous articleCan Dogs Drink Milk?